When a passenger vehicle and motorcycle collide, it’s usually the motorcyclist who bears the brunt of the injuries, if he survives the accident at all. After a motorcycle crash, motorcyclists can be seriously injured, in need of extensive medical treatment and rehabilitation, and unable to work while they recover. They may also suffer more devastating consequences if their injuries render them permanently disabled. While motorcycle accidents can deliver significant physical and financial blows to bikers, crash victims aren’t without legal recourse. 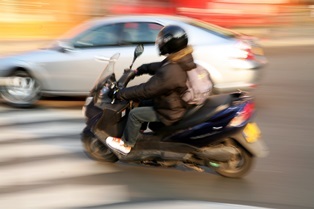 If the accident was caused by another motorist’s negligence, injured riders can file an insurance claim or personal injury lawsuit to seek compensation for medical expenses and other damages. Actually obtaining a fair financial award in motorcycle accident cases can be a bit of an uphill battle, due to an implicit bias against motorcyclists, as well as insurance company or defense attorneys who actively look for ways to reduce their clients’ financial obligation to accident victims. Fortunately, working closely with an experienced motorcycle accident attorney and familiarizing oneself with common motorcycle accident defenses can help. If you’re considering taking legal action after sustaining severe injuries in a motorcycle accident caused by a negligent motorist, here’s what you need to know. Insurance adjusters and defense attorneys use a variety of tactics to try to discredit a biker’s version of events after an accident, such as claiming he or she was at least partially responsible for the crash. The defense claims the motorcyclist engaged in reckless behavior, such as speeding, swerving, or riding while under the influence of drugs or alcohol. The defense claims the accident was caused by motorcyclist error, such as failing to make himself visible or failing to ride defensively. The defense claims the accident was actually caused by a problem with the motorcycle. The defense claims the rider waited too long to file a motorcycle accident lawsuit. According to Texas’s statutes of limitations, personal injury cases must be filed within two years of the accident. When a motorist claims he or she weren’t responsible for an accident, motorcyclists can prove fault with the assistance of police reports, medical records, traffic citations, witness statements, and testimony from expert witnesses, such as accident reconstructionists. Also, injured motorcyclists can still potentially collect compensation for crash-related damages, even if they were partially responsible for the accident, according to Texas’s modified comparative fault rules. Negative stereotypes of motorcyclists being reckless, dangerous riders who take unnecessary risks and endanger others on the road can make mounting defense claims a challenge in some cases. However, according to a Florida Department of Transportation and University of South Florida Center for Urban Transportation Research study analyzing 10 years of crash data, motorists—not motorcyclists—were at fault in 60 percent of motorcycle accidents. An experienced motorcycle accident personal injury attorney can help bikers overcome biases and prejudices that could negatively affect the outcome of their case. If you were seriously injured in a motorcycle accident that wasn’t your fault, you may face significant financial challenges. The award-winning personal injury attorneys with McGartland Law Firm can help you pursue compensation for a wide variety of economic losses, such as past and ongoing medical expenses for accident-related injuries, property damage to your motorcycle, lost wages, and loss of earning capacity if you can no longer work. Motorcycle accident victims can also seek a monetary award for non-economic damages such as pain and suffering, mental and emotional anguish, and reduced quality of life. Contact McGartland Law Firm today to schedule an appointment for a free initial review of your motorcycle accident case.